After taking a look at Guy Savoy’s autumn menu, full chestnuts, squash, and truffles, I knew I had to take a little trip over to the 17th for some seasonal indulgence. The restaurant is situated at the dead end of Rue Troyon, an arm’s reach away from the Arc de Triomphe. For those who are daring enough to drive there’s even valet parking, or at least a uniformed guy who looks like like he’d park your car and actually return it. Despite arriving nearly forty-five minutes early, I was promptly seated without hesitation to begin a five hour meal that would ultimately leave me disenchanted. 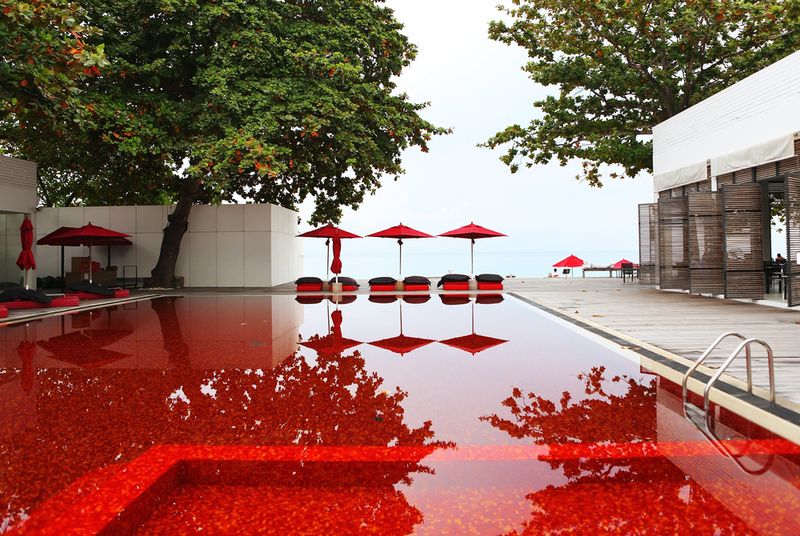 The restaurant itself is divided into several small rooms, making the atmosphere a bit quieter and comfortable. Due to the size of the rooms, there were no middle tables: everyone had a wall. The decor was modern, with multicolored glasses, plates, and miniature butter cups making each table a bit more fun. The ceiling of the room in which I ate had a faux skylight, illuminated by a blue-tinted fluorescent light mimicking end-of-the-day sunlight. The ambience was a bit more light and jovial than I would have expected from a Michelin three star restaurant, which was refreshing. I started with a glass of champagne and began to slowly peruse the menu. Glancing through the menu, there were several dishes that caught my eye; particularly, tout châtaigne, an all chestnut soup and turbot et champignons à la mode d’automne, turbot and seasonal autumn mushrooms. I knew I had to try soup d’artichaut à la truffe noire, perhaps Chef Savoy’s most famous dish, despite the off-seasonality. Decisions, decisions. There was a tasting menu, “Le Menu Prestige,” but there were several dishes that I would have wanted to substitute (veau cuit lentement en bouillon, quelques racines en compote et champignons de bois, slowly cooked veal with a vegetable root compote and wild mushrooms, and poêlé de moules et mousserons, jus “terre et mer,” a poêlé of mussels and foam with a “land and sea” sauce to name two). But then, my hands accidentally flipped over the page where I saw a very special menu, “Couleurs, Textures et Saveurs,” an 11-course extended tasting that featured every dish I wanted to try, without any substitutions necessary. Done! The restaurant had quite an extensive selection of bread, over 15 types, in fact. Country, whole wheat, olive, raisin, almond, sourdough, chestnut, and rye, to name a few. The breads, most impressively, came in such interesting shapes and sizes. One of which was a gigantic ring with stegosaurus-like spikes. I really wanted to try that one; but it didn't seem to be available for cutting. The first amuse bouche was truffled foie gras pâte and “toast” served on a skewer. 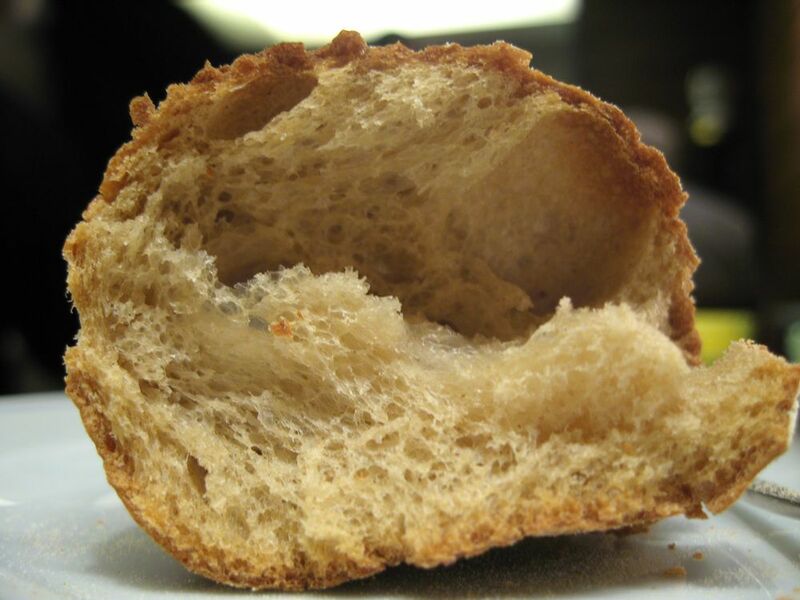 The toast had indeed been toasted; but it was at room temperature by the time of service, making it more like a croûton. This hard texture was unappealing. But the nuttiness of the foie gras and the fragrant truffle oil certainly did jump start my senses. 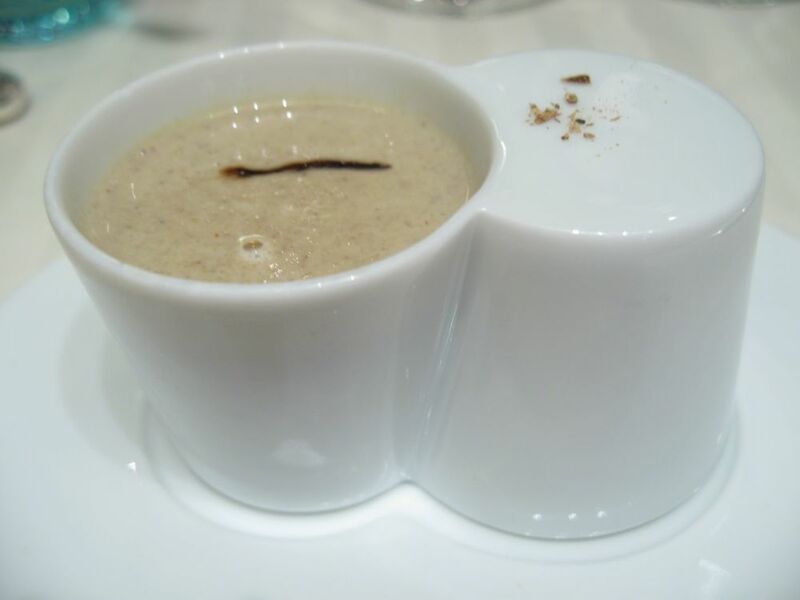 The second amuse was served rather creatively, a duo of chanterelle soup with a baby potato filled with minced chanterelle and topped with a small caramelized onion. The soup came in an espresso-sized cup conneced to an upside-down cup that covered the potato. I really enjoyed the mushroom soup, particularly the warm hearty consistency, which was surprisingly dense with flavor. The boiled potato, on the other hand, was bland. A little salt could have gone a long way. The first course of this tasting was L’Huître en nage glacée transparente, a single suspended oyster in a transparent gelée. The presentation for this dish was very original, a cold clear glass bowl sitting on top a bed of seaweed, invoking images of the sea even before the tasting began. Sitting on top of the oyster was a small piece of sea urchin, the shape of which was flattened due to the weight of the gelée. I was told to eat this in one bite so as to let all the flavors mix at once. This did indeed taste like the ocean, the cool gelatinatious texture of the gelée and sea urchin blending with the smooth surface of the oyster. What a nice way to begin a tasting menu. I’d never tried radish leaf before, a part of the radish that is often discarded; but in the next course, turbot et champignons à la mode d’automme, turbot and autumnal mushrooms, the leaf added a really fresh and crisp contrast to the cozy olive oil mashed potatoes. 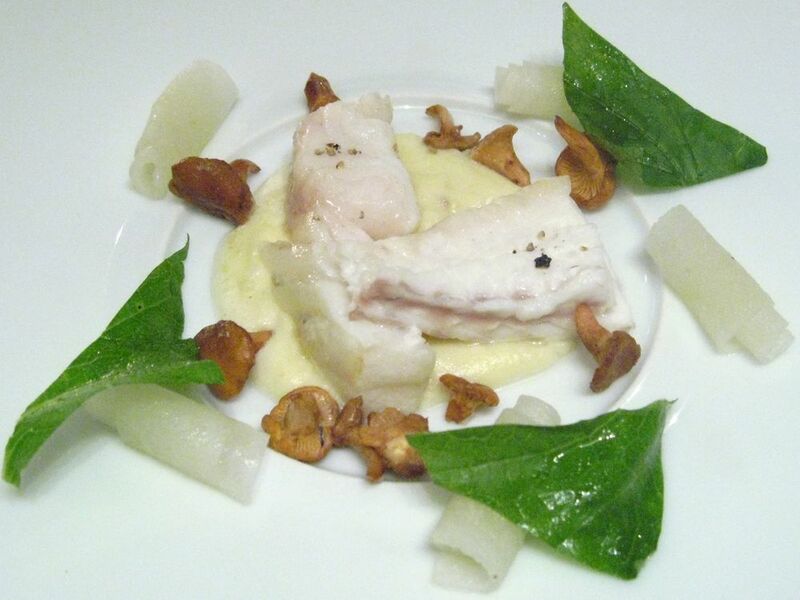 This dish consisted of filet of turbot sitting atop a bed of olive oil pommes purées, surrounded by small wild mushrooms, rolled white radish, and white radish leaves. I really liked the firm texture of the turbot, which magically held its shape after each bite, when combined with the soft potatoes and crispy radish leaves. My biggest problem with this dish was the rolled white radish, which was surprisingly wet. The water from the radish began to pool around the perimeter of the olive oil potatoes, creating a stark temperature contrast that seemed a bit sloppy. That being said, it was amazing to me how much flavor could be locked into these radish leaves. The spiciness of the leaves added a bit of dimension to the turbot, both in terms of flavor, temperature, and texture. Overall, this dish was very nicely balanced. It’s pretty hard to accurately depict how excited I was for the next course: tout châtaigne, or entirely of chestnut. For me, no food more powerfully incites images of the fall than chestnuts, except perhaps pumpkin and white truffle. I look forward to chestnuts every summer, and a big smile came across my face when I saw them on the menu. Unfortunately, I was really disappointed. This next course was three large chestnuts, a chestnut crème, and wild mushrooms. The dish was sauced table-side with a chestnut soup and foamed milk. The chestnut broth was incredibly thin, having the consistency of low-fat milk. This thin texture did not adequately support the firm starchiness of the chestnuts. In addition, the soup had an indiscernible chestnut flavor, and was much more reminiscent of milk than chestnuts. The chestnut crème in the center had a similarly dull flavor. This dish had so much potential. The most beautiful course of the night came next, Colors of Caviar, 4-layers of colorful crèmes and foams stacked inside a transparent glass cup. From top to bottom, a truffle sabayon, green bean gelée, fromage blanc custard, and chestnut mouse. There was a lot going on here. I was instructed to eat all four layers at a time with my mother of pearl spoon. I enjoyed every layer in this dish except the fromage blanc, the acidity of which assaulted every other layer, particularly the truffle sabayon. The airiness of the sabayon only emphasized the truffle’s fragrance; it was a very intelligent decision to make that the top layer. Each layer utilized the caviar for salting which ensured that it’s flavor was not muted. Aside from the clashing of the fromage blanc, this was a pretty interesting course. Next came the highlight of the tasting, homard bleu juste grillé racines oranges, blue lobster grilled for an instant with orange root vegetables. Let me start by saying lobster jus and puréed carrots is a wonderful combination, especially during the fall. The carrots were so finely puréed that they seemed to float on the plate, the flavor of which at times pointed in the direction of butternut squash. I do think this dish was a bit under-sauced, especially on the lobster tail, which seemed to dry out from the lack of sauce. But the lobster was timed just on the verge of undercooked, something I really appreciated. There was a random radish leaf standing upright in the carrot purée, which frankly had no purpose in this dish other than for variety of color; but the flavors of this dish were so rich, I just pushed it to the side and my eyes quickly tuned it out. Following the highlight of the meal was also the low point, foie gras de canard rôti et nage de chou rouge avec choux frisés au raifort et moutardes, roasted foie gras in a broth of red beet. The foie gras was cooked for quite a bit of time, making the texture a little firmer than I would have liked and preventing me from tasting the creaminess of the liver that, for me, is one of its strengths. The flavor of the beet broth was too intense, making it difficult to taste anything other than beet. Similarly, the raifort was too strong, pummeling all the other flavors on the plate. The plate was also burning hot which continued the cooking process of the already over-cooked liver. This was no good. One of Chef Savoy’s better known dishes, soupe d”artichaut à la truffe noire, came next, an soup of artichokes with lentils and black truffles served with a “brioche feuilletée aux champignons et beurre de truffe,” a brioche layered with mushrooms and truffle butter. It’s incredible to me the way this soup captured the flavor of artichokes, to the level where at some points, if I were blindfolded and texturally inept, I would probably say I were biting into the heart of a fresh artichoke. The texture of this soup was really special, hearty with just a touch of grain to remind you that this is indeed a vegetable soup. The fragrance of the black truffles were quieted by the broth, perhaps table-side shaving would have fixed that as I had a difficult time smelling them. That aside, this was definitely a very nice soup. The truffled mushroom brioche sure did smell nice, and the table-side buttering was kind of funny; but I don't think it added much to the soup -- it's not like I was going to use it for dipping. As a little intermezzo, I was brought a small cup of truffled squash consommé, a rich and creamy introduction to the meat course to follow. Last of the savories was pigeon poché-grillé, polychromie d’endives crues-cuites, a textural mix of pigeon poached and grilled, with endives both raw and cooked. This competed with the Colors of Caviar dish as being the most colorful of the evening, with the burgundy colored endives complimenting the rare game. The pigeon sat atop a bed of caramelized endives, which were incredibly sweet, a nice balance to the salty pigeon. The dish was drizzled with a few drops of parsley oil, adding forest green to the pallet of colors. Aside from the caramelized endives, which was definitely among the best preparation of endives I’ve had, the game was rather lackluster and the raw endive salad seemed misplaced. Next was the cheese cart. Oh, the cheese cart. Unsure of where to start amongst this diverse selection of French cheeses, I asked fora small wedge of pretty much everything, minus a few generic cheeses I don’t particularly like like époisses and brie. Let me note that the table to my right, with only two cheeses, kept glancing at my two plates of 20 cheese with a bit of plate envy, or, perhaps they simply thought I was crazy. The highlight of this cheese tasting was the 40-year cave finished comté, a hard cow milk cheese with nuances of caramel. Last came the desserts, prunes à la syrah, granité aux poivres and noir, prunes in syrah with a pepper granité, and dark chocolate sorbet atop a chocolate tart. Both of which left me rather unfulfilled. The syrah was way to overbearing on the prune ices, making it very difficult to taste anything remotely plum-related. And the chocolate could have benefited from a little fleur de sel, the presence of which always seems to make chocolate desserts more interesting. The highlight desserts came along with he bon bon trolley where, as usual, I opted for one of everything. Particularly interesting was the raspberry cheesecake which was just under-sweetened and even a bit salty, to actually exaggerate the flavor of cheese. The texture of this was light and fluffy, unique for cheesecake. I also very much enjoyed a small cake of pistachio, raisin, and coconut. The small cake was mostly fruit and nuts using the bread only as a binder to hold everything together. While the waiter was working hard at the bon bon trolley, another waiter brought me a warm prune petit four that had just a slight smell of coffee. What a difference a warm pastry makes. A waiter placed a lemon scented marshmallow in my hand, as if I didn't have any say in the matter (I dislike marshmallows very much and this one was no different). One of the petits fours from the bon bon trolley had a hidden surprise on the bottom, which when flipped over, revealed the Guy Savoy logo. I was disappointed by the vanilla and chocolate macarons which were very hard; but, I liked the cherry Madeleine. The Madeleine actually didn't come from the dessert trolley, it was brought out warm from the kitchen. Again, what a difference a warm pastry can make. Overall, I enjoyed my experience at Guy Savoy; but it was underwhelming. The restaurant remains so traditional at its core that it seemed afraid to take risks. A lot of the dishes were a bit bland and at times, frankly, boring. Some of the dishes, particularly the all chestnuts dish, had tremendous potential but materialized to be only fair. Would I return here? Absolutely; but not too soon, there are too many other restaurants in this city!